Dairy free lactation cookies, made with coconut oil. Packed with oats, brewers yeast, flax seed and hemp seed that will increase your milk supply while breastfeeding. 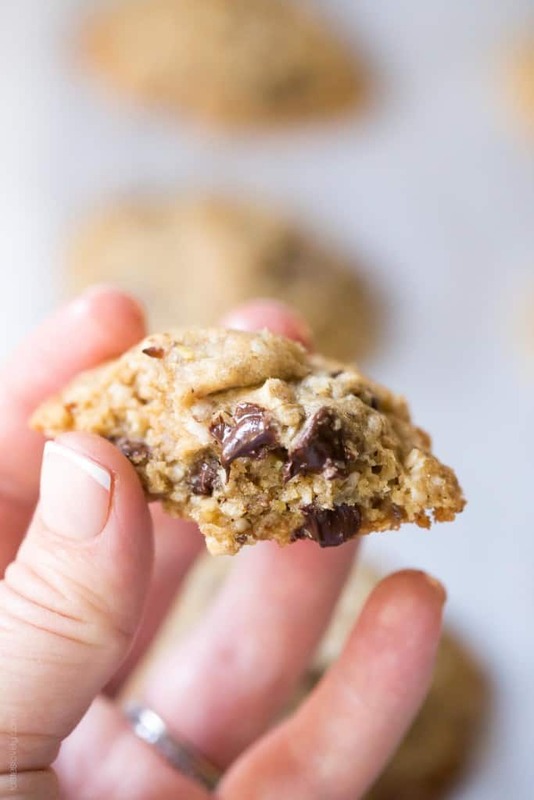 Or, just a delicious and healthy chocolate chip oatmeal cookie if you’re not nursing! 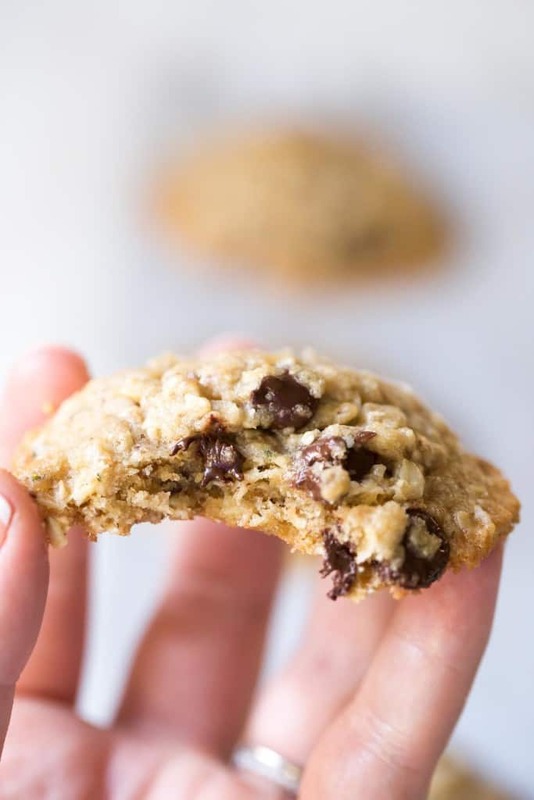 Ok nursing mamas, these lactation cookies are for you. After my 6 week postpartum check up, my doctor cleared me for exercise. After all that time I spent on hospital bedrest, and then having extremely limited mobility while recovering from my c section (ouch! ), I was excited to be able to go outside with Josh strapped to my chest for long walks in the sunshine. We go for an hour walk every day around the neighborhood. I do 3 laps up what I lovingly refer to as “hell hill” – a very steep and long street that leaves me breathless and sweating, even in the middle of January. The walking has been so therapeutic for me. I love getting out of the house, getting my heart rate going, and seeing all the people stop and smile as they sneak a peak at little Josh. He is just so dang cute! A few days after I started exercising, I noticed a decrease in my milk supply. Eeek! I didn’t want to give up my walks, so I started researching ways to boost it naturally. Mother’s Milk Tea and lactation cookies were the biggest recommendations. I was skeptical about whether or not lactation cookies would really work. If anything, I thought it was just a great excuse to eat more cookies. And with all the extra calories my body is burning while breastfeeding, I’ll take all the cookies I can get. I am craving sweets, and feel way more hungry than I ever did pregnant. I needed a dairy free lactation cookie, since Josh has acid reflux and eating dairy provokes it. I tried a few different versions. Some that used shortening (ick), some that used Earth Balance vegan “butter”. As much as I love Earth Balance on toast or when scrambling eggs, I don’t like the taste it gives to baked goods. I experimented with my own version, and wanted to try one that used all coconut oil since I love the subtle flavor and sweetness of coconut oil. Plus, coconut oil has great health benefits. After a few tries, I finally perfected the BEST dairy free lactation cookies made with coconut oil. They are also packed with oats, brewers yeast, flax seed, and hemp seed, which are all nutrient dense and will naturally boost your milk production. 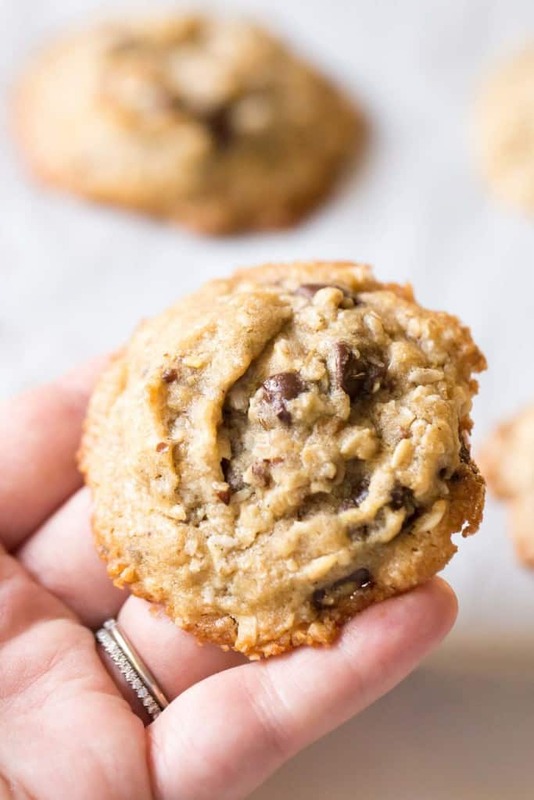 These dairy free lactation cookies are delicious! Shawn is obsessed with him. When he saw them on the counter and ate one, he proclaimed them the best chocolate chip cookies he’s ever had. I told him they are actually lactation cookies, and he stopped mid-chew. I wanted to trick him and tell him yes. Ha! But no, they’re just nutrient dense and can be enjoyed by all. These cookies have crispy edges, and have a semi soft interior. They’re not dense hockey pucks like other lactation cookie recipes I tried. The oats give them a delicious chew, and the coconut oil gives it a light and pillowy texture, along with giving them a subtle sweet coconut flavor. You do not taste the brewers yeast, flax seeds or hemp seeds at all. And of course the chocolate chips are delicious. I use Trader Joe’s or Kirkland semi-sweet chocolate chips, which are naturally dairy free. But even better than tasting great? They really do work! I noticed within a few hours that my milk production was back up to what it was before exercising. Josh was back to being a full and happy baby. And all thanks to eating cookies! I also started eating oatmeal every morning for breakfast and adding a tablespoon of flax seed and hemp seed to it after I heat it up which I think also helps. Glad to have a happily fed baby once again! And if you don’t have time to make your own, or want even more lactation boosting snacks, check out these dairy free lactation granola bars from Oat Mama! Preheat oven to 350 degrees with the oven rack in the upper and lower third. Line 2 baking sheets with parchment paper. In a medium size bowl, combine the oats, flour, brewers yeast, flaxseed, hemp seed, baking soda, baking powder and salt. Stir to combine. Set aside. Using your stand mixer (or in a large bowl with a hand mixer) beat the coconut oil, granulated sugar and brown sugar over medium high until light and fluffy, about 3 minutes. Add the egg and vanilla extract. Beat another minute until combined. Turn the speed down to low, and slowly add the dry ingredients. Beat until combined. Add the chocolate chips and beat briefly until just combined. Using a medium size cookie scoop (1.5 tablespoons), scoop the cookie dough onto the cookie sheets, 12 per sheet. Will make exactly 24 cookies. No need to chill the dough. Bake for 12-14 minutes, or until the cookies are just starting to turn golden on the edges. Remove from the oven and allow to cool on the sheet for 5 minutes before eating. Will keep in an airtight container for 1 week. Freezer Tip: Scoop all 24 raw cookie dough balls onto 1 parchment lined baking sheet. Freeze on the baking sheet, about 1 hour. Put all the frozen raw dough balls in a freezer safe Ziploc bag. Bake frozen dough balls at 350 degrees for 13 minutes. This way is great if you only want to bake a few cookies at a time, rather than all 24 at once! I’ve never heard of a lactation cookie before! This sounds perfect for all of those nursing moms out there. And for me, this sounds like a delicious cookie! 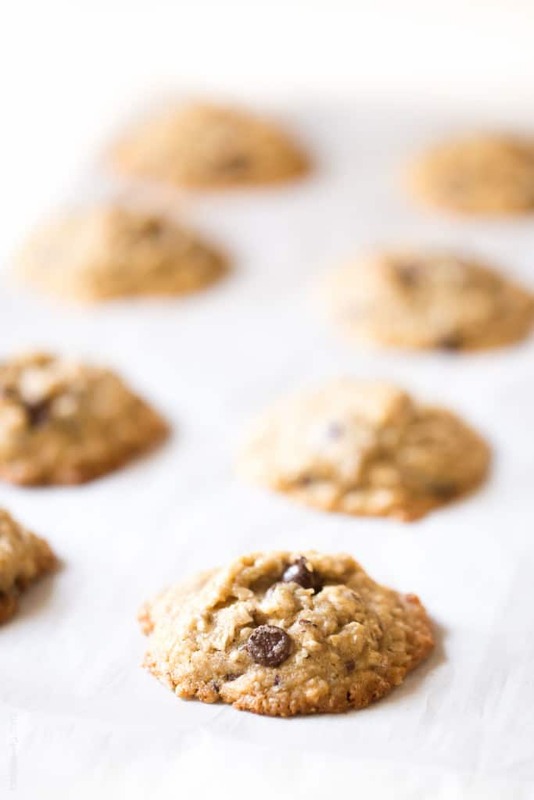 I remember hearing about lactation cookies and wondering what they were…they look pretty delicious if you ask me ;) So glad you are all clear for walks/activity! Yay, so glad you get to go out on your walks again! Getting out for some fresh air sounds perfect and so do these cookies! I lived off steelcut oats (and still do) and it totally helps with milk production! I’m so glad these cookies are helping you too, love all the goodies you added in here! I hope you and your baby are doing well! I never knew there was such a thing as lactation cookies but I wish I’d known when I was breastfeed. I will keep these bookmarked for my next pregnancy <3 Thanks for sharing! These cookies look AMAZING, Natalie!They look so soft and chewy! You had me laughing with Josh’s reaction when you told him these were lactation cookies! Nat, I am glad your doctor cleared you for exercise. I also love walking and this really helps to feel better and energetic. Your little one is so cute. I love seeing his pictures on Instagram. So! My friend who is a lactation consultant told me that it IS possible for men to lactate. I refused to believe her until I finally Googled it, and, lo and behold… it’s a thing. Apparently. LOL! I think Shawn is safe with the cookies, though. ;) These look super yummy! Will definitely be baking up a few batches in a couple months! Natalie, how did you know I have been craving cookies?! I am whipping these up to help with my supply too! Aren’t they so good?! Best excuse to eat cookies, right? So when I was really trying to boost my milk supply, I would have 1 in the morning, 2 in the afternoon, and 2 at night. Just to give my body tons of good nutrients and calories to boost milk supply. And I was also drinking a TON of water. I was trying to have 8 ounces every hour. Within a week, my milk was back, and then it was REALLY back, and I had to cut back on the cookies. Hope they help you out momma! Biggest hugs to you. Hi.. I was just wondering if making 6-8oz an hour with these cookies will cause less hindmilk and hence less weight gain for the little one? Was your little one gaining weight fine? As much as I want to have a freezer stash, but I also don’t want to cause the little one to not get enough hindmilk which is so essential for them! I just whipped up a batch and they are WONDERFUL!! But I do have a question, were yours crumbly?? Mine are falling apart. I wonder what I did wrong? I followed the recipe. Any ideas?? Crumbly or not, they are awesome! I’m so glad you liked them Kelli! Mine do get a bit crumbly on the very outer edges, but the rest of the cookie is sturdy. Is your coconut oil still a solid when you are making them? I have never used ground hemp seeds before. At the store I saw ground hemp seed hearts, is that the same thing? I am soooo happy to hear you made them! These would be the perfect dessert to bring to new mommas. I bring it to all my new mommy friends. And smart to have these ready to go in your freezer! I’m so dang excited for you Jess! And your husband comes home today, right?! So now baby girl can come at any time! When I made these they spread out super thin!! What did I do wrong?? Should the coconut oil be liquid or solid when mixed? Room temperature is liquid, but you note that it shouldn’t be melted, and the liquid form mixed with sugar doesn’t get light and fluffy the way a solid would. Yeah, depending on the temperature of where you live, room temperature coconut oil can be solid or liquid. After making these with room temperature (liquid state) coconut oil, I’m guessing that isn’t how it’s intended! My cookies spread out so thin and turned into one huge uni-cookie that crumbled into pieces when I tried to take off a piece. I had the same issue. I was watching them bake through the glass on my oven door and all the coconut oil oozed out and then the cookies all flattened. I noticed when I reread the recipe I used whole hemp seeds. I am going to grind them and try again. I did start with solid coconut oil, for the record and other than the ground hemp, followed the recipe exactly. I have never left a message on someone’s blog before but I really felt like this was a must. I made these cookies over the weekend and they are absolutely delicious. I just added coconut flakes since I had some in my pantry. Everyone in my house loved the cookies, hands down some of the best home made cookies I’ve ever had with an added benefit. Thank you so much and will definitely be making these again next weekend. It was also great because my daughter has a milk protein allergy, so this was perfect. Also, thanks for the tip, I’m now eating oatmeal for breakfast regularly. I haven’t seen any changes in my supply yet but I’ll keep at it. This makes me so happy Nikki! Thank you for letting me know. 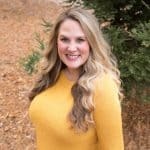 My son had issues with dairy, and I gave it up for 7 months. And I felt so much better after eliminating dairy, now I’m off it permanently. Congrats on your baby girl! You’re doing great momma! I’m so glad you like them Bayli! My very favorite cookie, even when I’m not nursing! I have to eat non dairy made these cookies with nutritional east instead of brewers and also I put raisins instead of chocolate and they came out so good absolutely delicious. The only tip when you place them on the baking sheet make some room between they raised a lot and mine looked like one big cookie. They also came out very crunchy can any body tel me how to make them more chevy and moisture? These are absolutely delicious. Dangerously so! I didn’t have any soy-free chocolate on hand (it’s very hard to find), so I substituted dried cherries and they turned out great. The cookies are flat but have a great crispy and chewy texture. My milk supply has been up since starting on these, though I also take fenugreek and blessed thistle. In any case, they are packed with nutrients, which must be helpful for nursing moms. Thank you so much for the recipe. Thanks so much for these! I am dairy free for my little one right now, and at the 7 month mark my supply started to go down. I made these (with nutritional yeast) and my supply boosted! Thanks so much, just made another batch. Are the flax and hemp seed necessary or can I leave them out? Thanks! Not necessary, you can leave them out if you don’t have any on hand and want to make the cookies right away. But if you can, get them! Adds tons of nutrients! Just made these. In oven as I type ;) My son has ACID REFLUX as well. But I couldn’t find dairy free chocolate chips at walmart! :( I’ve been trying hard to cut out dairy but it’s more of a challenge then I thought. Any tips?! Cutting out dairy and really acidic foods helped my baby a ton. We also put him on baby Zantac. He still has issues with dairy. When he eats dairy, he has really loose stools and throws up sometimes. I think it gives him heartburn. So no dairy for us! I transitioned him to my homemade almond milk when I weaned him off breastmilk. He loves it! No issues at all. Just make sure you baby doesn’t have a nut allergy first. Best of luck momma! You’re doing great! These are awesome. I used sprouted flour instead of regular and coconut sugar instead of white and brown regular. I ate a lot of these the first few days my little one arrived and she gained her birth weight back in a week. I did start over producing a bit so I backed off the cookies and got back to optimal production. Thank you for the wonderful recipe!!! The first time I made these they spread out extremely thin and the thin crispy edges made them a mess to eat. They were still delicious though, so I devoured them embarrassingly fast giving me the opportunity to make another batch with some changes. The second time around I only used 3/4 cup of coconut oil and upped the flour to 1 cup, and the oats to 1 3/4 cup and they came out perfect. I’m about to have baby #2 and will be needing these cookies for sure! Can’t wait to start making them again. Glad you found a ratio that worked perfectly for you. Best of luck with your little one and keeping your milk supply up. You’re doing great momma! Congratulations Maggie! I’m due with my second on June 29! So soon! It just get’s easier with 2, right? *wink* Hahaha! Hope you love the cookies and they help your milk supply as much as they help mine! Thank you for this recipe! My supply just dropped and I’ve been so down…. I am dairy free and soy free for my little guy, and I am allergic to wheat, gluten, and corn. Would almond flour be a good substitution for the all purpose flour? So glad you found my recipe! I really hope these cookies help, they help me a ton when my supply needs a boost. I’m due with my 2nd in the next 2 weeks, so these cookies are going to be back in the rotation very soon! It doesn’t have gluten, wheat or corn so hopefully it will work with your diet. Hmmmm, you have me a little stumped. Maybe brown rice flour? These are amazing!!! I rarely ever comment on blogs but felt it necessary :) Thanks for the great recipe. I’ll probably make them even when I’m no longer nursing! I’m so glad you liked them Kelsey! This made my day! Means so much you took the time to let me know you liked my recipe. I have a new little one too (2 months old), and am enjoying these cookies on the regular again. I make them when I’m not nursing too, ha! I just replace the nutritional yeast with flour. What if I don’t have brewers yeast? I am wanting to make these and I looked around town, no one carries brewers yeast. I know I can order online but what if I left it out? Brewers yeast is what boosts the milk supply! You can leave it out, will still by yummy cookies. I’d replace the brewers yeast with flour. Otherwise, order online for the full lactation boosting benefits. If you need a milk boost in a jif, try a stout beer like Guinness! Thank you very much for sharing this recipe! When I had to go dairy-free I was really struggling with my milk supply. This was very helpful. Thanks! I really hope this helps Brandi! You’re doing great momma! These lactation cookies are amazing. They work sooo well. In fact, too well!! I had to ration myself which was hard to to because all I wanted to do was stuff my face with them! I’ve recommended them to a few of my friends who are struggling with low supply starting out and they are huge fans as well. Even my husband says these are his new favorite cookie. Once I assured him he wouldn’t start lactating he was happy to dig in. He even requested them for Christmas this year! Thanks for sharing! Yeah! I’m so glad you like them! They really do work. 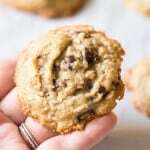 And hey, you’re a new momma, I think you deserve a few extra cookies : ) Thank you so much for making my recipe and letting me know you liked it! Means the world! Congrats on your baby! You’re doing great Momma!